During WWII, Pennsylvania held 26 POW Camps and 1 Japanese internment camp. Camp Olmstead Field in Middletown, Dauphin County, Pennsylvania held at least 281 German POWs. It is clear that POW’s often bonded or developed relationships while being held as prisoners of war. Perhaps this was the result of the War’s re-education program of POW’s as described in RG 389, File Unit 255. 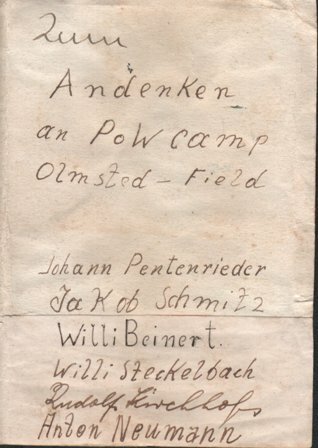 The records in this series document the attempted re-education of German prisoners of war (POWs) along more pro-democratic and pro-American lines, as well as the cultural and religious life of POWs interned in camps in the United States and Europe.” The subjects included attitudes, haircuts, education, and even “planning and releasing of American motion pictures to specific POW audiences. During WWII, 1944-1945, Charles H. Koegel, an American mechanic, served in the Army Air Corps at Olmstead Field, Pennsylvania. According to his son, he did speak German, implying he may have been a rather recent German immigrant. During Koegel’s WWII service, six German (or Austrian) prisoners of war worked under his supervision as mechanics in the motor pool. 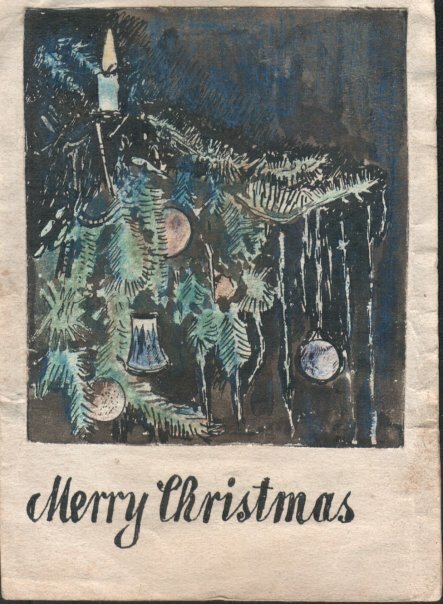 These POWs presented him with this Christmas card (front of card above). According to family, Koegel often wondered what ever became of these men. The family still cherishes this Christmas card. "In memory of the POW Camp Olmsted Field"
Although Charles H. Koegel died in 1994, his family would like to hear from any of these men or their families. Write us a note (a3genealogy@gmail.com) if you are acquainted with any of these POW’s. Great Lakes Research - Through Wisconsin? Family Secrets Hidden in Your Shoebox?